This 'campaign', that has flooded our timelines with celebrities garbed in blue, aims to tackle the urgent matter of the nation's dying rivers. 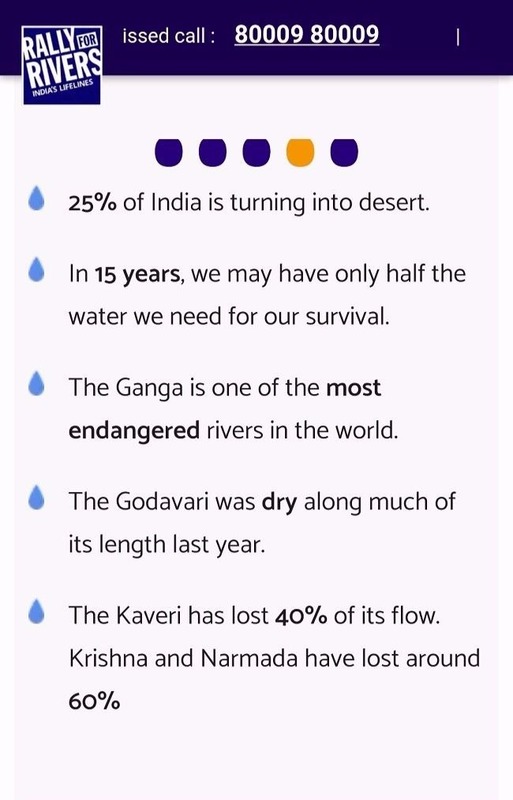 #RallyforRivers, an ambitious campaign that has flooded our timelines with celebrities garbed in blue, aims to tackle the urgent matter of the nation's dying rivers. Organised by the Isha foundation, it has seen the support of Bollywood and Kollywood actors, cricketers and even Union environment, forest and climate change minister Harsh Vardhan Singh. 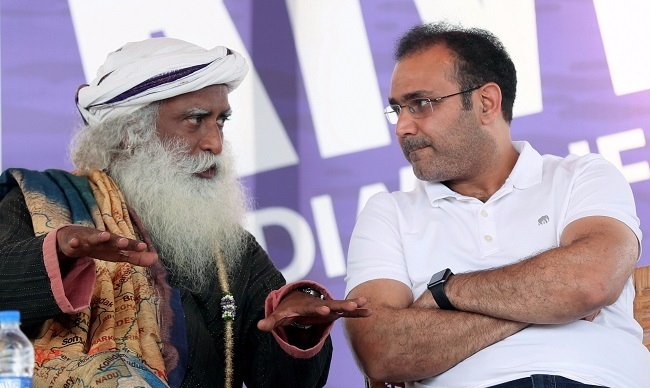 Jaggi Vasudev with Virender Sehwag at a “Rally for Rivers” campaign in Coimbatore on Sunday. PTI Photo. The star of the campaign however remains one man - Sadhguru Jaggi Vasudev. The spiritual guru, in order to mobilise support for the 'rejuvenation of rivers' is set to ride 7,000 km from Kanyakumari and cover 16 states. The rally was flagged off on September 3 and will culminate in Delhi on October 2. How exactly are we going to save rivers? Jaggi Vasudev has a one stop solution to ensure that India's rivers are restored to their original glory. First, to his credit, he identifies that there is a major problem in our hands. 'India’s rivers are undergoing a drastic change. Due to the pressures of population and development, our perennial rivers are becoming seasonal. Many of the smaller rivers have already vanished. Flood as well as drought are becoming increasingly frequent, as rivers turn unruly during the monsoon, and vanish once the rainy season is over,' reads the website dedicated to this campaign. Next, we are shown some stark facts regarding what the future holds. Third, he points out rightly, how the depletion of rivers will affect the common man. This includes inflates prices for drinking water, increasing crop failure and drought. While, the narrative is backed by numbers so far, things go awry from this point on. 'Forest trees can be planted on government land and fruit trees on farm land. This will ensure our rivers are fed throughout the year by the moist soil. This will also reduce floods, drought and soil loss, and increase farmers’ incomes,' it explains. Thus the spiritual guru, wants the government to plant a substantial number of trees for at least one kilometre width along the riversides. This, he points out will have vast environmental, social and economic benefits for nation and society. The way to facilitate the execution of this method, involves leaving missed calls on the number 80009 80009. The number of calls, will then be used to display the enormity of support. Many environmentalists have however questioned the 'cure', and say that the campaign has failed to identify the disease or its cause. The bone of contention begins with the proposed solution to the problem of India's dying rivers. Nityanand Jayaraman, a noted environmentalist, argues that, "Tree planting is over-hyped as an environmental good. If rivers are to be revived, it is not just trees that do the most good, but grasses, shrubs, aquatic vegetation, and hardy floodplain plants that can withstand and even thrive in intense flooding." The Ashoka Trust for Research in Ecology and the Environment (ATREE), for instance, opines that that while the campaign has brought the dialogue of river conservation to the fore front, the science to back it is missing. What ATREE is referring to here, is the sweeping assumption that trees can 'Keep rivers perennial, Normalize rainfall, Combat climate change, Prevent soil erosion, Improve water quality, Enhance soil quality'. "The arguments, though not incorrect, are incomplete, as the major causes behind the dying rivers lie elsewhere," says Veena, a fellow at ATREE. "To solve India’s drying and degrading rivers problem, we need to get the science right," she adds. The connection between planting more trees and receiving more rainfall is contested because increased rainfall has only been observed when land-use change and 'afforestation' is at much larger scales. A 1 Km buffer of trees on either side of the lake would be unlikely to affect rainfall. Trees can help prevent soil erosion, but only in places which are prone to flash floods. Trees can trap some pollutants, but when industrial effluents and domestic sewage is dumped directly into rivers and streams (as is the case across India), the sheer magnitude and nature of contaminants will not be abated by trees. One of the key reasons a river dries is because of the over-pumping of groundwater. As the groundwater gets increasingly sucked dry, any inflow of water into a stream goes into the ground. And watershed development only works when there is a consensus among user groups to use less water. In most battles fought to protect the environment, there is an adversary to be dealt with. In the Narmada Bachao Andolan, it is the Government which is building dams on the river. Closer home, in the case of the Cooum river, it is against Metrowater for illegally dumping sewage into the waterbody and industries for allowing effluents to be released untreated. In Jaggi Vasudev's campaign however, there is simply no enemy. "This is the most polite fight to save the environment that I have seen," says Nityanand. "He wants to save rivers but what is he saving them from? Why are water sources getting polluted or depleted? Should this not be part of the narrative?" he asks. In an article, noted environmental Journalist Prerna Bindra, enlists the causes behind destruction of rivers as - Mining of sand beds and boulders, pollution, deforestation, encroachment on river beds, biodiversity destruction, river-linking, river conservation policies (or lack of them). The rally she argues, fails to address these major problems. 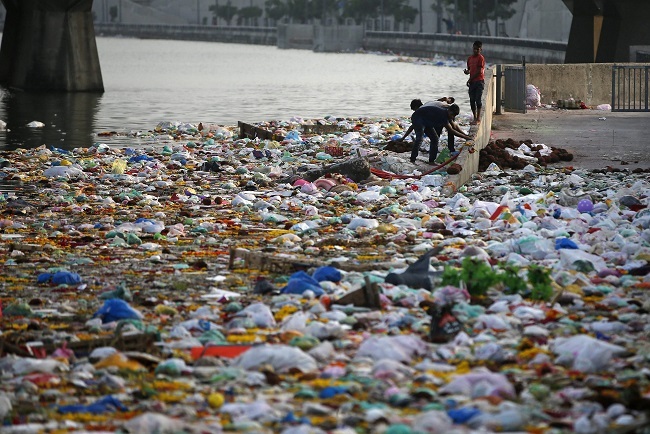 A polluted river in Ahmedabad. "To leave out the bigger problems would mean the solution is merely cosmetic," says Veena. "Trees are not going to help our cause if industries keep dumping effluents into water bodies. Why is the Ganga polluted? It is due to untreated sewage released into it. Why not address how dams are going to affect these water bodies. This is greenwashing where you remain silent on key issues and give planting trees as a solution," she explains. Nityanand, points out that several sponsors for the 7000km rally have already directly or indirectly contributed to the degradation of the environment. Some of the sponsors include Adani group that is mired in more than one environment related controversy, ONGC that is facing flak for oil leaks in Tamil Nadu and Mahindra group headed by Keshub Mahindra who once headed Union Carbide, the company involved in the Bhopal gas tragedy. Mercedes to save the environment? 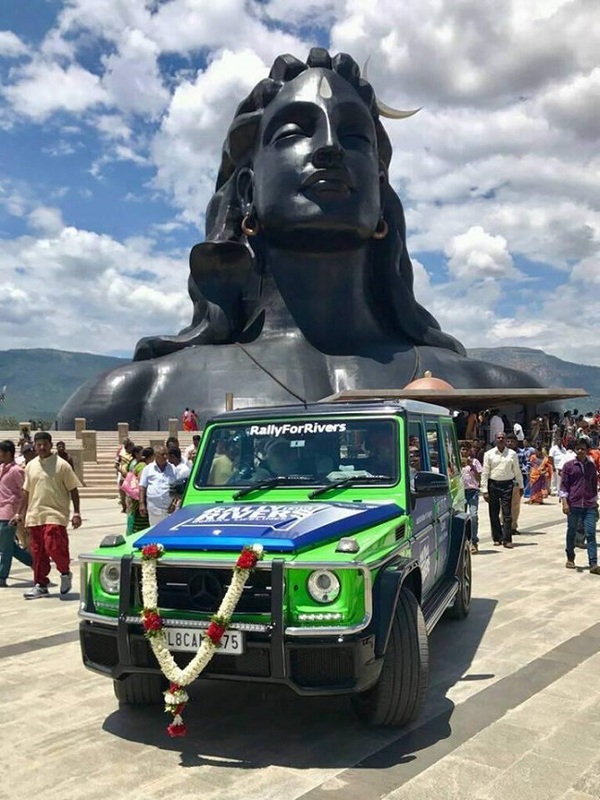 But the most bemusing parts of this campaign has to be - the alien green Mercedes that Jaggi Vasudev is using to travel. The Mercedes G63 worth over Rs 2 crore gives a mileage of 11.8 km per litre and is not exactly the symbol of sustainability, argue environmentalists. "The car symbolises what this campaign stands for - complete fluff," says Nityanand. "Tree planting or lake cleaning or reviving rivers ought to be tasks that are done mindfully, fully aware that it is not just an act of reconstruction, but also of protest against an economic system that enslaves and deploys us all to work against our own life-support systems," he argues in a social media post. While Jaggi Vasudev's attempts to start dialogue on saving rivers are commendable, the way he has gone about it washes out any credibility the campaign may hold, opine experts.